As the fall season kicks into gear, Governor Tom Wolf continued to increase workforce development for dislocated workers, invest in small businesses, and expand broadband access to more than 9,000 currently unserved rural Pennsylvanians. 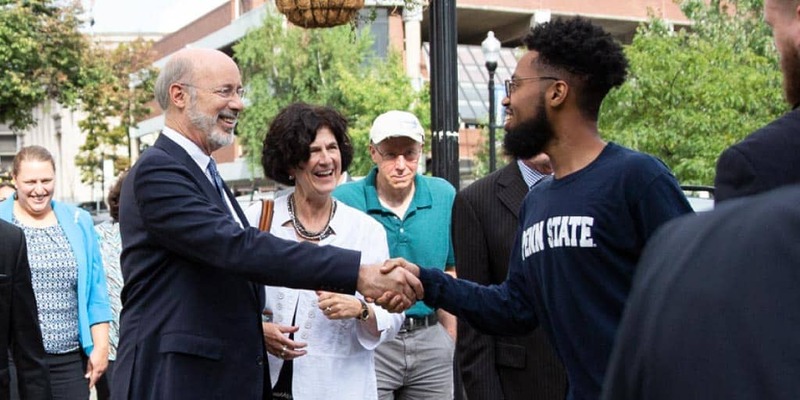 Governor Wolf built on his PAsmart initiative by announcing more than $17.5 million in grants to help dislocated workers in Pennsylvania learn new skills and get in-demand jobs. In addition, the governor announced new apprenticeship opportunities in manufacturing and electrical, plumbing, and HVAC careers. This month, Governor Wolf announced more than $78.4 million in funding for infrastructure and community revitalization projects, including the reopening of the First Bank of the United States and more than 42 multimodal projects across Pennsylvania. Enhancing connectivity across the commonwealth, the governor announced plans to expand broadband to more than 9,000 currently unserved rural Pennsylvanians. Governor Wolf also announced the launch of a new feasibility study on adding passenger rail service between Altoona and Pittsburgh, acknowledging the continued interest in this service. Governor Wolf announced investments that will create more than 600 new jobs in fields ranging from gene therapy to aluminum manufacturing. The governor also announced funding for small business projects that are expected to create and retain more than 250 full-time jobs across the Keystone State, further supporting Pennsylvania’s middle class. Last week, I was in Philadelphia to announce my administration’s support for the reopening of the First Bank of the United States. The bank, the Liberty Bell, and Independence Hall are part of Philadelphia’s @independencenps. These sites are integral to our nation’s history. The bank once served as the foundation to modern United States fiscal policy, but today it is closed to the public and in need of repair. Proud that my administration will enable this historic landmark to reopen. Yesterday I was in Altoona touring state-funded projects revitalizing the area. Renovations are underway at the Mishler Theatre (first photo) that will preserve its history for years to come. I also visited @theclaycup (pictured in second photo with owner Sarah Vogel) and JJ Hadley and Co. Brewers, which are bringing new life to downtown. Our cities large and small have a lot to offer, and businesses like these contribute to a community’s quality of life. #PAproud to support this transformation.